When it you need to hold many legal size documents, the expandable escrow jacket is a flexible way to accommodate up to 1" of materials. It lays flat and expands as needed. An overall aqueous coating will be applied if necessary at no charge. For foil stamped or embossed folders, no coating will be added. Generally, business card and other slits are not used with this product, but are available upon request. Production time is 5-7 working days after proof approval. 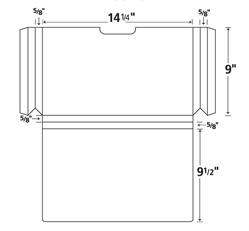 14-1/4 x 9-1/2 expandable escrowjacket with front sleeve pocket; exposes ½" tab from back panel. Folded at bottom, glued on both sides, open at top. Three scores, 5/8" apart at spine and sides of sleeve pocket for flexible expansion to hold 1" of legal size documents. Delivered flat. Printed one or two ink colors on front and back. The Expandable Escrow Jacket is a flexible way to accommodate up to 1” of important documents & materials. It lays flat and expands as needed.